Note: Used Hardback - 328 Pages (1986), Written by Roger Vadim. CLICK IMAGE FOR DETAILS. Appears new and unread! first printing 1966. Reprints classic Batman meeting The Joker comic book stories. Just normal age tanning. Tight spine. Super nice...right off the racks from 1966. Kerpow! Appears new and unread! 1966 first edition. Paperback reprints classic Batman comics featuring The Penguin! Ace paperback, tight spine with only age tanning. Right off the spin around rack from 1966. A book that came out right at the explosion of Beatlemania! This is a 1964 Lancer book, one of the first books to jump on the scene to capitalize on the Beatle craze in America. Loads of photos and histories of the members and back ground. Fold out poster page. John, Paul, George and Ringo! Rare Hardback - 418 Pages (Photoplay First Edition 1926), Written by P.C. Wren. CLICK IMAGE FOR DETAILS. A fun Scholastic paperback jammed full of photos of apes from movies with funny cartoon balloons. Similar to Stan Lee's Monster Madness magazines. First edition from 1968. Autographed "To Ron from Bob Burns." Autographed at the MONSTER BASH CONFERENCE. From Midnight Marquee...a detailed look at some of Lugosi's most loved films explored by many noted authors. Illustrated with lots of great photo reproductions. 312 pages. Published by Gotham Books, Written by Gary Don Rhodes with Richard Sheffield. The personl life and history of Bela Lugosi! Great book, highly recommended. CLICK IMAGE FOR DETAILS! By Greg Mank. This greatly expanded new edition examines Lugosi and Karloff's mutual films. Detailed filmography of Karloff and Lugosi films, both men's careers and more than 250 photographs, some in color. CLICK IMAGE FOR DETAILS. By Bill Kaffenberger and Gary Don Rhodes. Bela Lugosi in Person brims with new facts, figures, and never-seen photos documenting the actor’s scores of live public performances. Scores of photos and ad reproductions from 1931-1945. An amazing book on the life of Bela Lugosi. 419 Pages. Joseph Sheridan LeFanu (1814–1873) is regarded by many critics as the greatest master of the English ghost story. He sums up in his work better than any of his contemporaries the fears and dreads that may haunt the sensitive individual. Vampires and hauntings! Packed with great FM articles, photos and gloss pages with a heavy stock cover. Karloff, Lugosi, Lee, Chaneys....they're all here! Out-of-print. Get it for your collection now! Wow! Appears unread! BLACK CAT horror novel by the co-writer of NIGHT OF THE LIVING DEAD, John Russo. 1982 first printing. Autographed "To Dan from John Russo" on inside front title page. First edition 1923 hardback book. Photoplay edition from the movie BLACK OXEN. The book still has dust jacket (some damage), but is in a clear protective library sleeve. The complete movie itself appears to be lost. Book includes photo plates. Binding good and solid. 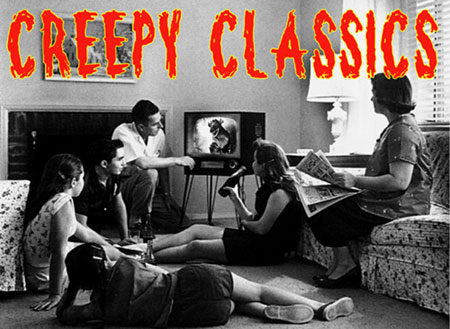 It's first-hand encounters with the makers of classic monster movies! A young boy growing up in Hollywood is fascinated by the wondrous film industry and is swept in by the love of it all. Bob was on the sets, became a "gorilla guy" and has the best stories. As told to Tom Weaver. Photos too! By Scott Allen Nollen. Each of Karloff?s horror films is examined at length, as well as his contributions to other media. Over 100 posters, portraits, film scenes and candid photos illustrate the text. CLICK IMAGE FOR DETAILS. From Midnight Marquee...a detailed look at some of Karloff's most loved films explored by many noted authors. Illustrated with lots of great photo reproductions. 384 pages. This is the novelization of the classic sequel to FRANKENSTEIN. Written by Michael Egremont and part of the Philip J. Riley's Nightmare Series. 153 pages. Beautiful poster reproduction cover. By Tom Weaver with Greg Mank, Frank Dello Stritto and others! Introduction by John Landis. An in-depth view of the 1951 film BRIDE OF THE GORILLA with Raymond Burr, Lon Chaney Jr. and Barbara Payton. The script, loads of background details, essays, press book art and rare photos! Shovel in hand, Gary Rhodes (with Tom Weaver) returns to the Graveyard of Forgotten Facts, unearthing a treasure trove of terrific illustrations and a casket-full of new information on Bela Lugosi, Ed Wood and BRIDE OF THE MONSTER (1956). BRIDE’s shooting script and a vault full of decaying extras. The crime sleuth that was featuring in a series of films. This novel is a clothbound hardback edition from 1944. Typical age tanning of pages, slight shelf wear. Good, tight binding.